Iñárritu @ Tokyo Film Fest~ | personal.amy-wong.com - A Blog by Amy Wong. The Tokyo International Film Festival (TIFF, not to be confused with Toronto LOL) has just announced that Mexican director Alejandro Gonzales Iñárritu (Amores Perros, Babel) will be presiding the 22nd edition of the festival to be held from October 17 to October 25th this year. Also… like I’ve mentioned before, the Tokyo Film Fest, alongside the Shanghai Film Fest are quickly turning into the most important in the region. 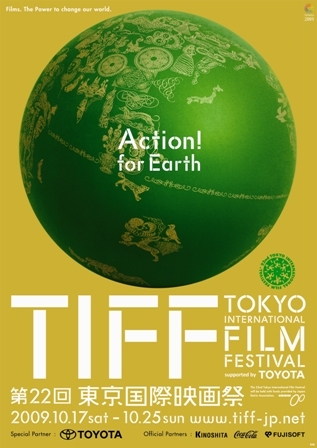 That is why I was so disappointed that our film, after winning awards in the last 13 film festivals it had entered, was rejected by the Tokyo Film Festival, whose theme this year is green. Not that it is that much of a shocker, but the main goal for making the film was to shut down the cove in Taijii, Japan, where 2,300 dolphins are killed every year. Remember that time when Hayden Panettiere got in trouble in Japan for eh… I dunno, swimming with the dolphins? But you know, dolphins are cute this is why it deserves a documentary (and it will probably win an Oscar for it if the cuteness continues). Penguins are cute too, I admit it (and they also won an Oscar, LOL). But cows aren’t. This is why cows don’t get a documentary, and we all get to eat meat regardless of how they are slaughtered. I’m usually not a big fan of this one-side documentaries, because I’m pretty sure they won’t show how Taiji sees this as a way to sustain its town. And it will be all about saving the dolphins… and the people saving them. – I’m looking at you Panettiere. xD – I wonder if they give an alternative to sustain the town’s economy, as well as ranting about how people kill dolphins. You know, it’s fine to show the problem, but it’s not much use without a solution. So we stop hunting them, then what? How would they survive? Please, they’d better not suggest “Dolphin Watching” or I’ll shoot myself. As far as I’m concerned, we shouldn’t be allowed on “x-animal watching” ever and allow the disturbance in their habitat. I love eating. I love meat, I can’t live without it. A meal without meat feels not done. One of the reasons I can’t be a Buddhist – I tried a Buddhist meal once in Hong Kong. So good, but gone so fast. Had to eat again 2hrs. later. Perhaps, I can suggest watching Departures? Things sometimes need to die for you to survive. Also, when I was 17-ish… I used to sort of look up to PETA, now I just think they’re pretty annoying. Perhaps they should try to change the way they preach. It seems like they just lost something along the way. Like their sanity. Oscar Best Picture Noms to Expand!